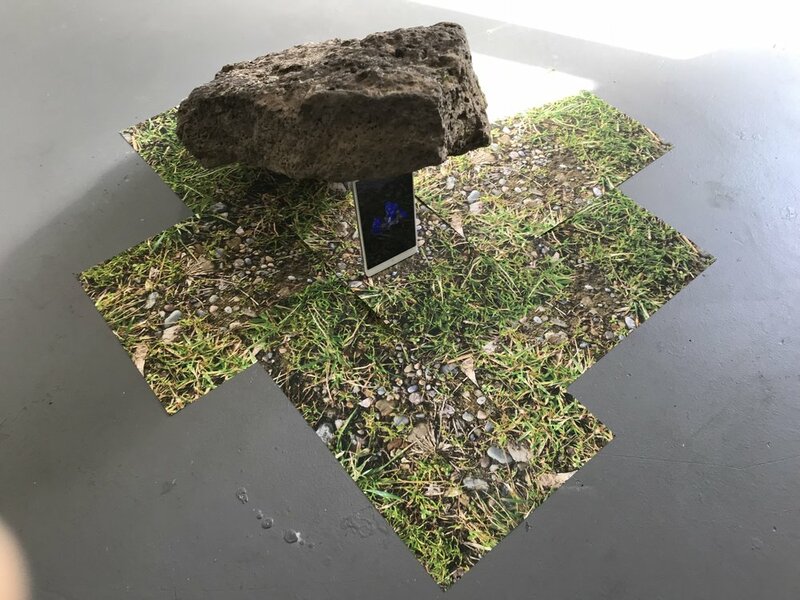 Carnation Contemporary is a new members’ collective that opened on September first with an energetic group exhibition, First Date, featuring work from all 14 of its artist-members. On the one hand, it seems that the gallery has big shoes to fill, occupying, in the Disjecta building, the physical space that was formerly home to the esteemed Carl and Sloan Contemporary, which presented 12 consistently well considered shows of primarily abstract work during their short run, introducing audiences to numerous artists from both within and outside the region. As the third members’ space in Portland, Carnation also joins the ranks of Blackfish Gallery and Nine Gallery, spaces whose myopia has rendered them all but forgettable. If Carnation is thinking long-term, then Blackfish and Nine should be the cautionary tales of which they should take heed. There is a very fine line between excitement they feel now and stagnation and irrelevancy within the closed system of the members’ gallery. Members’ spaces occupy a difficult position in an arts ecosystem. They are great places for artists to learn how to exhibit their work, safely experiment in an environment outside of market pressure, and get feedback from a chosen peer group. But like any pay for play structure, membership raises its own set of suspicions. What kind of quality control is there on membership or individual shows? How does the gallery resist becoming insular? Are members beholden to anything more than a monthly payment? If you are thinking career wise, members galleries add length to your CV, but not necessarily prestige. The talent pool in Portland is so shallow that it’s easy to forget that arts administrators are actually important members of the art world. With an administrator like Brian Ferriso leading the Portland Art Museum, who righted the museum financially only to leave it without a chief curator, there’s little in the way of positive example. The institution is on a better financial footing, but still has no voice. He’s created a singular experience where the museum could use its position to begin engaging earnestly with any number of dialogs, but removed the apparatus to do so effectively. As has previously been an issue with PNCA and OCAC, building expansion is valued more than what happens behind the walls of those new structures. Good arts administrators have a vision as important as any artist. They build spaces that become platforms for a diverse array of artists’ voices. They find audiences that both appreciate and support the artists they exhibit, and most importantly, they find fundraising possibilities that aren’t simply burdens to artists. At their best, administrators make it possible for a large group of artists to continue working. Members’ galleries aren’t necessarily thinking in these terms, and given there is likely a limited administrative structure helmed by artists with day jobs, there might be little time for Carnation to pursue much more than keeping rent paid and staffing open hours. We’ll soon see whether Carnation is merely providing a physical space to exhibit or if there is a more sophisticated look at opening opportunities. Through all my misgivings about future and purpose, there were certainly glints of promise in First Date, such as Carolyn Hopkins crafty altar on which a sequined deer, captured in macrame, bleeds ceramic blood drops. Renee Couture stands out, channeling Jim Hodges, in a delicate net of beads for the piece, In 1785 there was a here here, (perhaps referencing the discovery of the Columbia river in 1792?) The brash color and silliness of Jessie Weitzel’s sculpture, Beach Body, a colorful plaster sculpture that does double duty representing a potted plant and bikini clad woman, straddling the strangest line between outrageous bro-ism and righteous feminism. It’s not inconsequential that Carnation is located in the Disjecta building, as Disjecta built its reputation supporting local artists. Now, however, unless they are fundraising, locals aren’t especially welcome. They are invited into the biennial, which I’ve been told they keep because it is easy to fundraise for. It’s also worth mentioning that some of the previous tenants of Disjecta’s rental spaces have reported harassing behavior from the administration, so no matter how determined the Carnation artists are, Portland yet again presents unreasonable hurdles in the way of what should be a normal artistic life.